Welcome to the website for railway.exe, also known as Railway Operation Simulator (ROS), a Windows program that allows you design, build and operate your own railway. Build and operate your own railways. 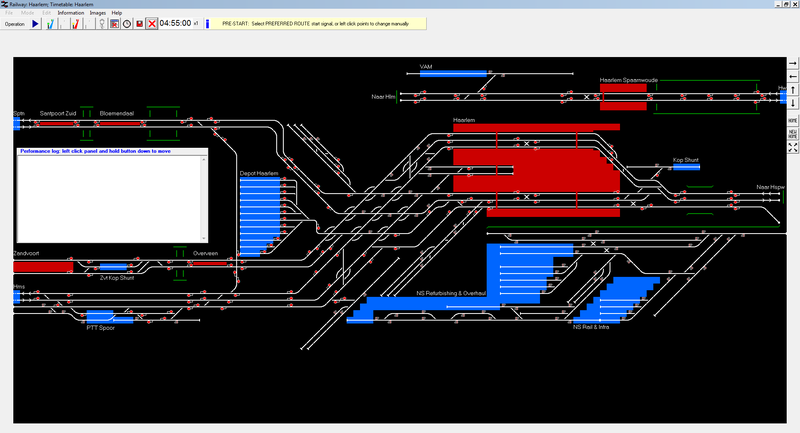 Make your own timetables for your own and existing railways. Download more railways from this website. Submit your own railways to this website. Detailed performance log, so you can improve your score and see what went wrong, if any. Timetable output in plain text and .csv (spreadsheet) for added realism. Detailed information about trains and their schedule. A wide selection of track element types is available for building the railway, together with station elements consisting of platforms, concourses and footbridges. Also available are non-station named location elements for sidings, works, depots, junction approaches and anything else that needs a name. Location names are displayed on the railway in user-selectable font, style, size and colour. In addition to named locations any other text may be added to the railway, again in any font, style, size and colour. Location names and other text may be moved in order to improve the appearance of the railway and areas of track may be selected and cut, copied, pasted, deleted, mirrored and flipped etc. Railway files may be saved and loaded in both development form during construction and in operational form on completion. Track element lengths and line speed limits may be set individually, along tracks, or in areas by selection, as can preferred running directions. Unrestricted routes: set from most types of track element to other track elements in any direction. The route is cleared as trains pass. In addition trains will run on track that has no route set, but they are then much more vulnerable to derailments and crashes. Signalling can be two, three or four-aspect, and ground position light signals are also available.